Communities in Pakistan are expressing their concerns on issues of gender equality, health and safety through community radio programmes. UNV and UN Women partnered in the west of the country to teach volunteers how to use effective radio broadcasts to inspire participation and change. UN Women and UNV worked with the University of Balochistan's Media Department and Radio Pakistan to train 30 community volunteers from the towns of Hazara and Khaizi on community-focused radio. UN Women and UN Volunteers launched a community-focused radio project in Quetta, Pakistan, in 2017. The aim of this project was to empower women through community focused-radio and volunteerism. It engaged marginalized women and youth in two towns, and established establish community-based radio programmes for entertainment, information and education purposes. The project garnered much interest from community members, and 30 volunteers were selected and trained with the support of the University of Balochistan’s Media Department. In addition to practicing their communication and presentation skills, the trainees learned about the importance of volunteerism, and their role as volunteers within the community radio project. They developed their gender awareness and participated in numerous team building activities. In order to develop content for their radio programmes, the volunteer broadcasters gathered ideas from listeners in the Hazara and Khaizi towns on the most critical issues facing their communities. Men and women in both towns ranked their issues separately, then agreed to tackle their common priorities to engage both gender groups. Volunteers from Hazara town chose to focus on women’s education and security issues, and volunteers from Khaizi on minority rights, health, hygiene and cleaning water tips. The volunteers used this input to develop radio programmes, which were aired with support of Radio Pakistan, Quetta. The groups of listeners in both communities continued to provide feedback and suggestions on community issues for radio programming. In December 2017, UN Women and UN Volunteers hosted a consultative workshop to evaluate the success of the project and opportunities for the future. The 36 workshop participants represented United Nations organizations, local government, Women Development, Social Welfare and Information Departments; the University of Balochistan and Radio Pakistan; as well as community volunteers and civil society organizations. Participants discussed means of ensuring inclusivity in their radio programmes, as well as promoting volunteering. 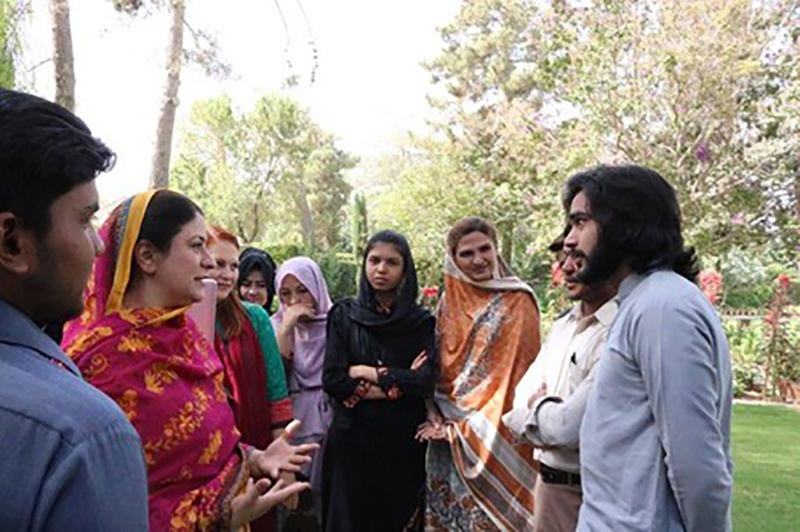 Ms Ambreen Gul, Assistant Director of Women Development Department commended the success of the project. “There is a strong link between communication and development, and radio is an inexpensive way to reach many people to get information, news, and education,” she said. The community volunteers shared how the experience changed their lives and the positive change they were able to contribute within their community through their mutual efforts. The resulting action plan proposed replicating the radio project elsewhere in the province, along with diversifying content and using the platform to bridge gaps and cultivate a culture of respect.